ring & roll sports was established in 1998 by Michael Müthel. 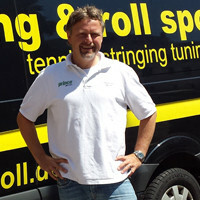 Its beginning root was in providing a mobile stringing service to tennis clubs in Stuttgart area. This mobile stringing service still remains an important part of our service offering. In 1999, ring & roll sports began providing service and support to professional tour level as official tournament stringers and catering to competitive tennis players of all levels. ring & roll sports is now regularly engaged at ATP-, WTA-, and ITF Tournaments as well as at numerous national events and other local tournaments as the official tournament stringers. In 2002, ring & roll sports began focusing on racquet customization and in 2007 became Wilson Sports’ official partner providing racquet customization expertise. Beginning in 2008, Gunther Strähle, head stringer of the German National Team began working together with Michael Müthel at Ring & Roll Sports. Gunther Strähle’s reputation as a key contributor to Germany’s success at the Davis Cup is well documented. In 1993, when the German Tennis National Team won the Davis Cup for the third and last time, he strung the rackets of Michael Stich, Marc-Kevin Göllner und Patrick Kühnen. Today, Gunther is not only responsible as the official racket stringer of the German Fed Cup and Davis Cup Team but also strings regularly on the ATP and WTP tour worldwide. Let ring & roll sports be your expert tennis partner and provide you the benefits of its experience as professional racquet stringers and racquet tuners. Ring & Roll Sports is not only engaged to work with some of the best known and top players in the game. Currently we look after over 1,000 players of which, of which approximately 300 play at a prfoessional level. As well, we manage the racquet preparation and stringing needs and reqirements a diverse range of Geman and international Davis Cup players Additionally, we work with many the best known racquet manufacturing companies in the tennis industry. Today we are the official racquet tuners for Wilson Sports, Prince and Head. Quality, dependability, timeliness and player success are our number one service priorities. “If a racquet can’t come to the stringer, why can’t the stringer go to the racquet”? With this simple philosophy, Michael Müthel established Ring & Roll Sports more than 15 years ago. Michael began this business out of his small Smart car and brought his stringing service offering directly to the "tennis player next door“. ring & roll sports’ name is now associated with exceptional service, expert craftsmanship and the quality of our finished product. Thanks to our many years of experience and our expertise in racquet customization, Michael has developed Ring & Roll Sports into a brand that is known and recognized around the globe. Today, tennis professionals from around the world, from players, coaches, teaching professional and, club players depend on our services and won’t accept anything else or less. In 1993, when the German Tennis National Team won the Davis Cup for the third and last time, he was already the man for the material. 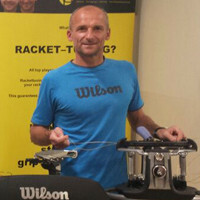 During the 4:1 win over Australia Gunther Strähle stringed the rackets of Michael Stich, Marc-Kevin Göllner und Patrick Kühnen. The man from Stuttgart probably always used the right strings since that time – today he is still not only responsible for the rackets of the German Fed Cup and Davis Cup Team but also takes care of the right strings on the tour worldwide. Oliver Müthel is Michael’s brother. After completing his study at school, Oliver did not hesitate very long before deciding to join forces with Michael at ring & roll sports. Since joining the Ring & roll sports team, Oliver has become a key part of the ring & roll sports success. He is a specialist in racquet tuning and stringing. Oliver is also often called upon to represent ring & roll sports team at international events and tournaments.